We’d all love to get more leads from our website enquiry forms right? Haha, if only it was that easy. Trust me, I know how you feel. I was in that same boat for years, spending ridiculous amounts on training programs and getting nowhere. These 2 actions alone is as much as 100% of the leads and sales activity in most small businesses. So what happens when you chat to that new person, or a referral partner says; “Hey, you need to go check out this business”? You may have heard by now that more than 80% of people go online and do some research before buying anything. Well the same is especially true in the business world. Think about it the last time someone referred you. You probably went online, found their website and had a browser around before making your enquiry. How did you find that experience? Did you feel a connection with the business straight away? Did you feel like they were truly the answer for you? Perhaps you then went looking for several alternatives as part of your online research? Now, switch your mind into the perspective of your website visitors and referrals. They are on your website, doing some research, checking you out, and they decide to send an enquiry. What’s the experience like for them? In 95% of cases, your visitors will find the contact form somewhere and get asked the basic questions; Name, Email, Company, Subject, Message, etc. Not only does this whole process cause many leads and potential clients to be disengaged when you reply to their website enquiry (which makes your sales process even harder), but it will also mean many of your visitors don’t even bother submitting an enquiry in the first place. So what can you do differently in this whole online website enquiry process that makes the experience for the lead better? and all of this was happening while the lead was in their peak buying state. Well in this article I want to show you 7 small, but highly effective things you can do to your website enquiry form that will help you do just that. First, we just need to understand how website enquiry forms fit into the bigger picture, into your business strategies. Yep, that’s right, using forms in your business is a strategy. Did you realise that? Now, some of you might not even know what Online Forms are, and that’s fine. We’re here to clear that up. Online forms are actually just questions you put online for someone to complete and provide you with information. 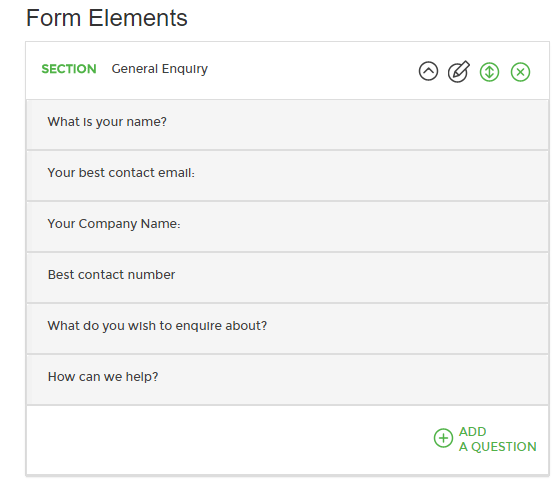 A website enquiry form or a contact us form is by far the most common. You see other examples all the time, and may just not realize it. You can use online forms for all sorts of things for your business such as; getting feedback, gathering information during from new customers when they start working with you, etc but today we’ll just focus on the things that make you money. These are horrible examples of a sales lead form and a contact form, but they illustrate what we’re talking about all the same. 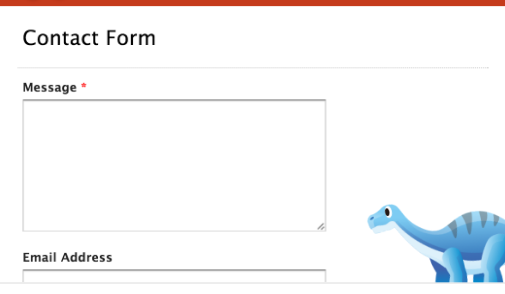 Online forms are actually something you can’t go without, but we rarely give it any attention. It’s like air. When we have it in abundance we never think about its importance, but after 10 seconds of no air, you go into crisis. When you go underwater and can’t breathe, you quickly remind yourself of the importance of air. There are a lot of things in business that are just like that. For me, one of those things is online forms. Most businesses use online forms either for lead generation, website enquiries, surveys or registration forms. But making online forms effective and efficient can be a challenging task to do. Most of the online forms out there are unfriendly, chaotic, confusing or just plain generic and boring. The good thing is that you can easily change all that and get much better responses from your visitors with a few simple tweaks. Optimized online forms will actually give you more time to work on your business, or if you’d rather spend with your friends and family, because they can be used not just in the initial enquiry stage, but also right throughout the sales process and beyond and it is the biggest step you can take to automating your business. That’s why we’ll talk about how you can maximize your online forms plus three ways online forms can help you automate your business. 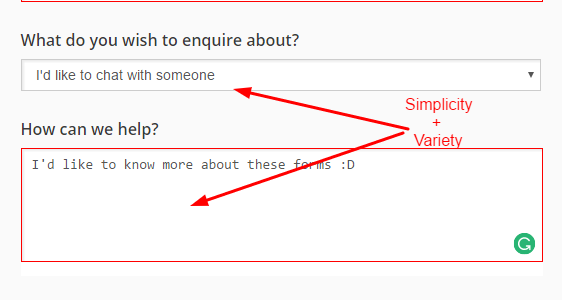 Let’s stick with the example of perhaps your single most important form, the website enquiry form. I will show you all the important factors that go into a successful online form and show you how you can do that too today. 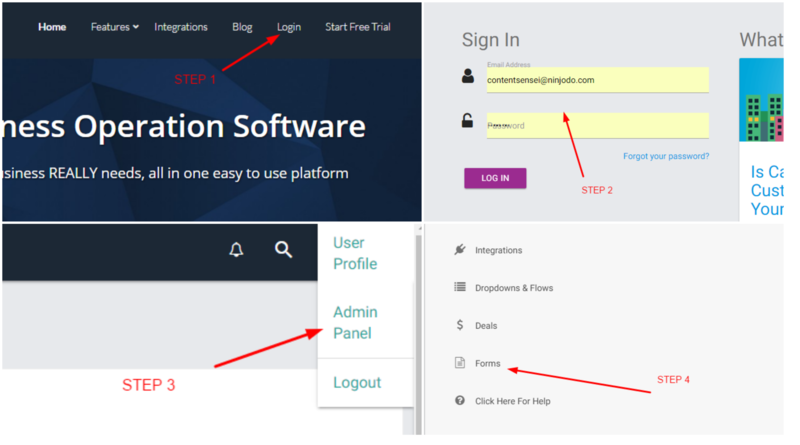 If you want to follow along you can follow the instructions below and grab a free trial of Ninjodo to try this strategy out. Note: You do not need to use Ninjodo for this strategy to work, but you may not be able to put in place some of the more powerful parts like automatic follow up and lead bio creation. For those of you following along at home, login to your Ninjodo account and then go into the admin panel. After that, you click on the forms tab on the left side. Here is the complete process. If you already have your form in place, you can edit, otherwise just click on “Add Forms” and work through this strategy with me. For this blog post, we’ll go ahead and edit the existing one to show you the key elements of a highly effective website enquiry experience. It’s so easy to make mistakes in writing questions for your online forms. You’re likely making it harder for the person making the enquiry. Consider that a thing of the past and let’s talk about how to frame your questions for the best results. First, thing you want to do is to make your first question light and easy to answer. When we’re talking about a website enquiry form we usually start with Name, then email, and proceed from there. Rather than being cold and using single words, pretend you are standing there with the lead filling in the form for them. How would you frame that question? Here’s what we in our enquiry form looks like after we apply this technique. You can see, “Name”, becomes “What is your name?”. It’s such a minor difference, but once you can get them to start filling in the form, the likelihood they’ll complete it and hit submit go through the roof. When people are asked a question they feel compelled to provide an answer. After this, you want to make sure to frame questions which will have a specific outcome. Don’t just ask for email, ask for which email you want. Do you want someone to give you their @gmail.com address or their work address? 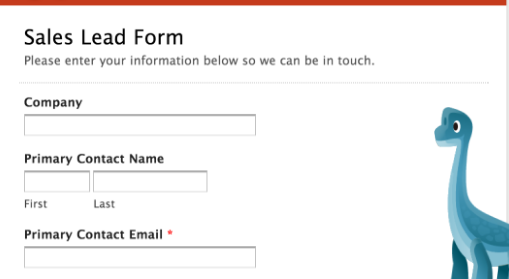 Remember, getting that email address is the single most important thing this form does. Without it, you don’t have a lead. If you need (or just simply want) specific information like phone number, or company name if you’re in the B2B space, then make these fields mandatory. You don’t want your time wasted by not getting a phone number, when you know you can convert your leads better through a phone call. You might think, what if they don’t enquire cause I am asking too much. Then how serious is the lead in the first place? Spend your time with qualified leads, people who have invested a little bit to start the conversation. Contact information especially should be mandatory. Without this you won’t be able to communicate with your leads and prospects afterwards. Another reason to make questions mandatory is to get the key questions answered. So, if someone wants to skip the key question they won’t be able to do that. If we take the above example they will get something like this. Make Your Lead Do Less Work! Online forms are there to make it as simple as possible for the person to engage and provide the required information. Too often people complicate things by, funnily enough, making questions too simple approach and providing no variety at all. Rather than making people type to answer all your questions, give them a few options to pick from. This stops them having to think, and allows them to answer faster with just a few clicks. Something to always keep in mind, people like variety and simplicity at the same time. It’s a little bit paradoxical actually, but every successful thing usually is. 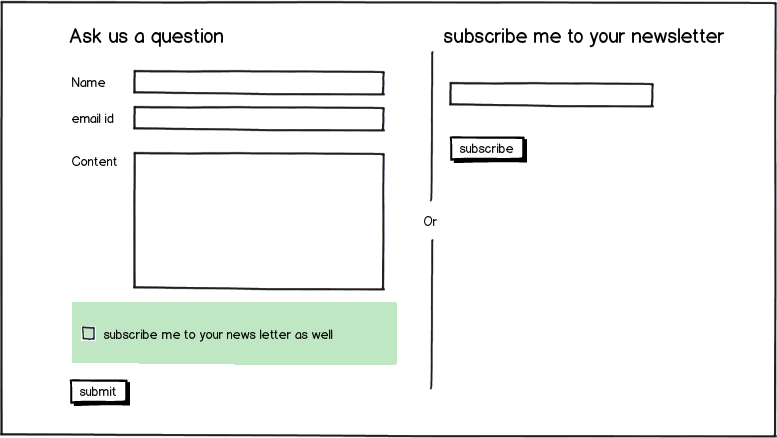 Look at how we made this form simple, yet diversified enough to capture user’s attention. This technique really comes into its own when you start using online forms for other things such as feedback, surveys, information gathering. What Happens After They Hit Submit? Now, this is crucial and I dare say it the most impactful thing you can do. Typically, when you complete a website enquiry, you get a basic and boring “Thank you” message on the screen. Nothing interesting or useful about that. The time your lead had to spend to complete the form and that’s all they get. Yet this time, the moment they have finished the form, is a prime time for you to further connect that person with you and your brand. Take a look at how our form tackles this and then we’ll get into details about what to do after the form is submitted. When someone hits submit, you can decide what happens next? You might go with a simple confirmation message, but then automatically redirect them to your blog so they can see how you think or your approach to what you do. Or perhaps you might want to redirect them to a specific sales or landing page based on one of their answers. Here is how we do it and what’s the final result. After your lead has completed the enquiry they will be automatically redirected to a page that you set. Take the redirect one step further, and make sure that a personlized email is sent to them after they make their website enquiry. Doing this poorly can actually ruin the whole thing for you. Your enquiry has been received. We will get back to your shortly. Put some effort into it, make it from the CEO or the owner, offer something of value in the email, give them a reason to remember you and come back to your site. You want to make sure to communicate all the right things with that email. and if you have them, great blog articles or videos. Make Sure The Enquiry Hits Your Radar, Not Your Inbox. Before I started using online forms in this way, I always missed sales enquiries that just went to my inbox. I don’t about you but my inbox can get pretty flooded pretty quickly and that can be a huge pain point. The results of that are you’re missing out on deals, losing sales opportunities because you’re too slow to respond, missing things, all because your website enquiries are getting lost in your inbox. This is the most important thing in your business…NEW BUSINESS. Make sure it stands out and you find out about it right away. If all your enquiries go into your inbox only, you can try creating a filter to send them into a specific folder, or use a very specific subject line to make them stand out. Once an enquiry comes in, make it a point to take them through a structured sales process. Many small business owners tend to just wing it and see what happens. This is a quick ticket to the sales valley of death. By having a specific set of steps your leads all go through, you can keep track of where people are up to and which things are working, compared to which things are not. Maybe people keep getting to the call stage but not getting much further. When your process is laid out for you, this type of issue is easy to spot, when you don’t though, everything just feels random. In addition to starting to really use online forms fully, a standard sales flow and workflow is the next key thing to automating your business. If the concept of a sales flow or sales process is new to you, or you still haven’t set one up in your business, grab a pen and paper and check out this step by step guide to having a rockstar sales process. You might also like to have the lead tagged so you know very specifically where they came from. When you do these steps with Ninjodo, a new lead gets assigned to the flow immediately and automatically. Here is how it looks for those of you following along at home. These are super simple to create and will save you a lot of brain capacity for when you need it the most. So what happens when you get a website enquiry from a lead who is in the very early stages of their process. It could be weeks or even months before they are ready to take things further. If that lead comes back and you can’t remember them, imagine how they will feel. Now imagine how they will feel if you respond like it was only yesterday you last spoke. Having all your history and details in one place allows you to do just that. You could try to search through your emails for the conversation, and maybe try keeping track of contacts in a spreadsheet, with lots of new and creative columns for details that don’t fit, but why would you when there was an easier way? 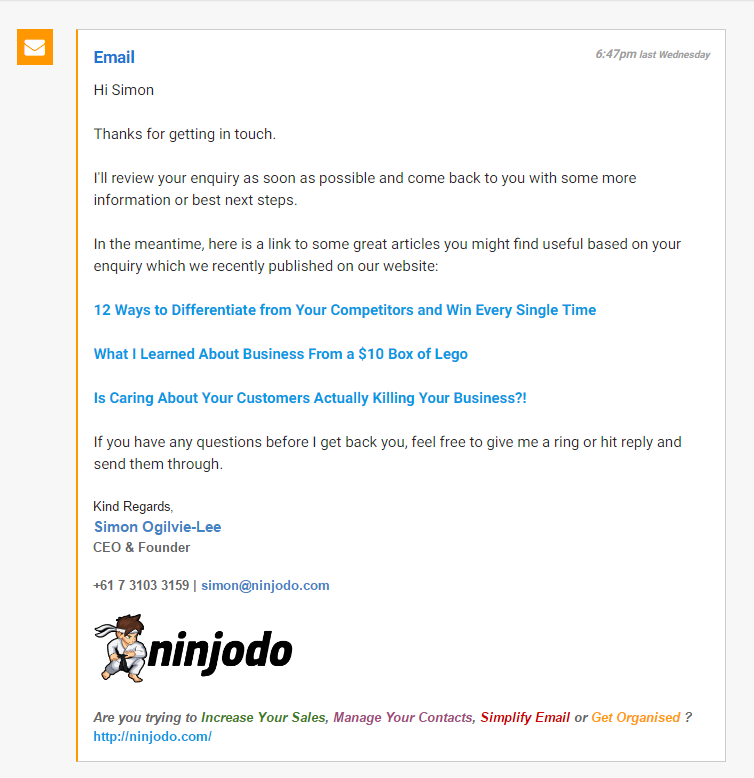 As soon as your lead hits submit, Ninjodo creates a contact record for them (yes again automatically). Now you may have only asked for a few things, but Ninjodo with its secret sauce can find out all sorts of things about this lead before you even see them. It’s created instantly and ready to track all contact details, emails, phone calls, and sales with that person. Here is how it looks in practice if we take Simon for example. Notice it even has social media accounts linked to the profile. So that’s 8 things you can do to get more leads and sales by upgrading your website enquiry experience. Five of those things make it better for the lead, helping them see you in a better light, setting you apart from your competitors, being more memorable, and ensuring your status as the right provider for them is elevated for your sales calls. And five of those things are all done completely automatically for you, imagine the time and clarity this would create for you, and how much easier your sales process would be. But that is just one form, you can use online forms for all sorts of things and get the same level of automation with each one. If you’ve been following along, how is your form looking now? Feeling more confident about converting your next website enquiries into sales right? Gets a “Thank you” message and leaves. The problem with this is that statistics show, just an hour later they’ve forgotten who you are and what your website or brand even looked like. And as we found out above, they will have submitted online forms on average to at least 4-6 other companies in your niche. They find your website, find your online form, it’s is beautifully presented and engaging, it’s easy to use and it is interactive. Once they hit submit, they are taken to a page on your website that specifically speaks directly to them and you form knows this based on the answers they provided just seconds ago. This gives you so much more credibility as the feeling that a company truly understands them is one of the greatest sales techniques of all. Then they get back to their inbox and see another touch point, your awesome email talking directly to them, showcasing you care about keeping them in the loop. And all of this is happening while you’re on a beautiful trip or barbecue with your family or friends. Now, if that isn’t amazing, I’m not sure what is. Then shortly after (or the next morning) they get a phone call from you. That’s an amazing sales flow and it can be automated completely. Now imagine how much better that follow up phone call is going to go if you’ve softened up your potential customer like that. They’ve seen what you can do, they’ve seen how you’ve helped other people who are already in a similar situations to them. They’ve watched a video, maybe read a blog post or two to learn about how you operate, how you do business, what your USP (Unique selling proposition) is. Who do you think they are more likely to want to work with now? Someone who’s done all of these steps and showcased care for them, or some other random company that’s not doing any of this. Of course your leads will always choose the first company. If you’re a small business owner or a startup owner every minute of every day counts. You should maximize everything you do and automate what you can without losing that personalised touch. Online forms, especially a website enquiry form experience like this, are made to make your work and life easier and start freeing up some of that elusive time we all seem to be running out of. They give your business a dose of automation and allow it to scale up without making you do more work. They are INSANELY powerful when business owners get busy. You also get huge bonus points with your leads & clients for making the process easy for them while at the same time appearing more professional as a business. Plus you’ll have more time to spend with your family and friends with all this newly found free time. And if you have no friends, then you shouldn’t use Forms for your business. Just kidding, I know you probably have a lot of friends. People love you and love to hear what you have to say. Keep it that way and share this blog with your networks and let’s make crappy website enquiry forms a thing of the past. I mean seriously, what year are we in now? If you waited til you’d read the full article before getting started, now is the time to go and give it a try. Click here to start a free trial of Ninjodo and give your leads a reason to choose you over the other 5 competitors they contacted to get quotes from.